PARIS (Reuters) - France is ready to help in North Korea's denuclearization efforts, but Pyongyang must first show some detailed commitments and real desire to dismantle its nuclear and ballistic arsenal, President Emmanuel Macron said on Monday. France, a nuclear power and permanent member of the United Nations Security Council, is not directly involved in talks between North Korea, South Korea and the United States to work toward the region's denuclearization. However, diplomats have said that given Paris' nuclear know-how it could play a role in the dismantling of nuclear warheads or receiving nuclear materials. 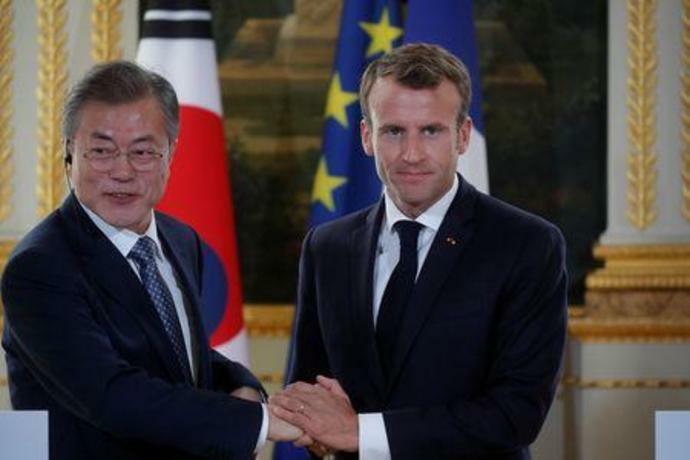 "We are waiting for precise commitments from Pyongyang to demonstrate its real desire to engage in a dismantlement of its nuclear and ballistic programs," Macron told a news conference alongside his South Korean counterpart Moon Jae-in. "We are ready to put forward our expertise and play an active role if a negotiation process is started." North Korean leader Kim Jong Un and U.S. President Donald Trump pledged at a landmark summit in Singapore in June to work toward denuclearization. But the agreement was short on specifics and talks have made little headway since, with the North refusing to declare its nuclear weapons and facilities or agree to a concrete timeline. "We have scientific, technical, operational, nuclear expertise which, in the context of a denuclearization, is very useful and which we want to make available if it appears to be relevant," Macron said. Moon said in an interview on Sunday that Kim was sincere in abandoning nuclear weapons. Speaking alongside Macron, he said it was crucial countries on the Security Council give North Korea confidence that "it had made the right decision" to give up its weapons program. Macron said that Security Council resolutions needed to remain in place and should only evolve with a complete, verifiable and irreversible denuclearization process. The reclusive communist state has no official diplomatic relations with France, one of only two European Union countries along with Estonia to cut ties with North Korea until it abandons its nuclear weapons program and improves its human rights record. "Depending on how this evolves ... we will envisage on the one hand changes in terms of our bilateral diplomatic relations and on the other hand changes to sanctions policy," Macron said. "I think it's good to keep seep some pressure levers to make sure there are changes," he said. WASHINGTON/SINGAPORE (Reuters) - The United States is expected to announce on Monday that buyers of Iranian oil need to end imports soon or face sanctions, a source familiar with the situation told Reuters, triggering a 3 percent jump in crude prices to their highest for 2019 so far. The source confirmed a report by the Washington Post that the administration will terminate the sanctions waivers it granted to some importers of Iranian oil late last year. Benchmark Brent crude oil futures rose by as much as 3.2 percent to $74.31 a barrel, the highest since Nov. 1, in early trading on Monday in reaction to expectations of tightening supply.